Exercising outdoors at the park or in an outdoor fitness area has great benefits. Combining exercise and the outdoors helps release numerous stress relieving and feel good endorphins in a natural, free and welcoming atmosphere. 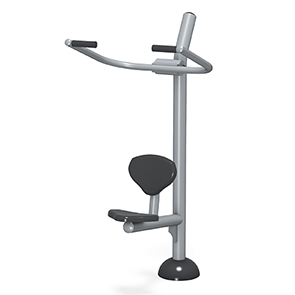 Designed to withstand continued exposure to the elements while encouraging healthier lifestyles, the all-steel, powder-coated Lat Pull-Down Station is an inviting addition to community spaces that appeals to both beginners and experts. Train, sculpt and strengthen shoulders, back and biceps without heavy weights by using the Lat Pull-Down Station. This user friendly, low impact machine uses isokinetic spring resistance that takes advantage of the force expended by the user to provide a challenging workout that helps tone and transform the upper body. This Lat Pull-Down outdoor fitness station only uses body and spring resistance, users are able to focus on the form and technique of the exercises while	improving core strength.